Heard of the latest attraction for kids in town? 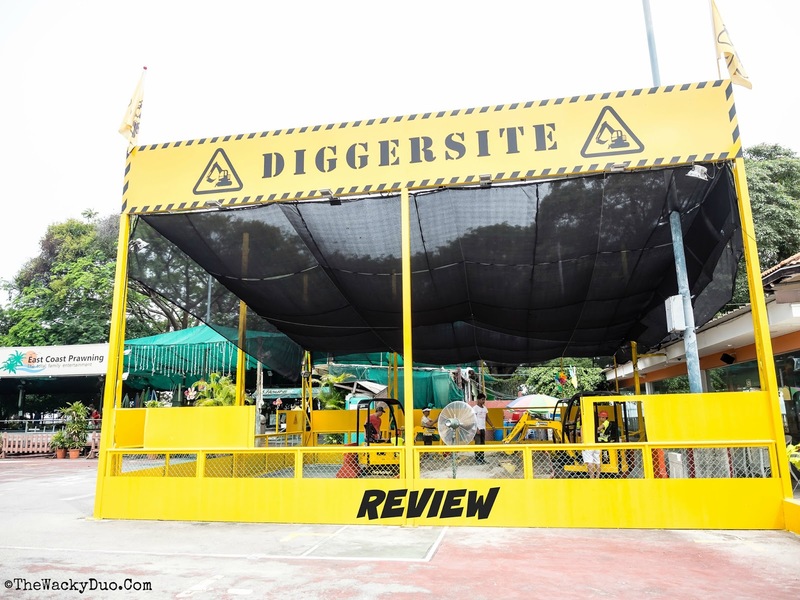 If you had ever fancied operating one of the cranes you had seen around construction sites, you or rather your child can have a chance to have a go at it at Diggersite @ East Coast Park. I must admit, it had been a secret desire to operate these mean machines, thus when the opportunity arose to test drive them, it was an offer that was hard to resist. Diggersite brings these miniature versions of excavator to East Coast Park. It was an apt location given that East Coast Park was probably formed with the help of cranes and excavators. When I told the boys that they are going for some sand digging in East Coast Park, they had initially thought it was with toys shovels at the beach. When they saw the excavtors, their eyes were lit with anticipation. For this activity, they were joined by their cuz X . The Wacky Trio can't wait to get started! You can suit up with provided helmets and vests to get immersed into the role. To operate the cranes, you would require tokens. Tokens can be obtained from the indoor station next to the main site. Each ride cost one token. Balance in the membership can be kept for future rides.Granted it is not cheap, but these are real machines not your amusement toys that you pay $5 to ride in amusement parks. There are 3 stations around Diggersite. The most popular one would be the sandpit. The aim of the games is very simple. Use the hydraulic excavator to dig the sand from the sandpit and filled it into the buckets provided. This station is outdoor but there is a net shelter that provides sufficient cover from the scorching sun. These excavators are not your 'toy version' excavators you would find in your local toy store. These are real machines that makes real construction noises and jerky movements that are similar to a real crane. The machines are meant for children age 4 and upwards. Adults can have a go at it if you must. For kids less than 6, adults supervision is a must. For kids that age, adults can also co ride with them to guide them along. Honestly after seeing how much fun the boys had on the rides, I would think if an adult is operating on them, they would probably take over the vehicle all for themselves! It does take a little while to get use to it, but once the boys are familiar with the ride, it is good to go. There are staff on hand to give some tips to operate the machine when needed. Even 5 year old L had no issue operating it on his own. Just look at the way he crossed his legs and operated the machine at the same time ... like a boss. It does take alot focus to get the job done as demonstrated by the serious look on L.
Being big fans on claw catchers, we were delighted to see the modified diggers as giant crane / claw catches. Needless to say the young padawans decided to test their claw catching skills at this station. They were met with varying success with their catches. This station is alot harder than it looks, so for younger kids, adults supervision is highly recommended. The last station is the wrecking ball station. Here a mini wrecking ball is attached to the end of the crane and used to smash the bottles down. The crane is also under a shelter but there are no sheltered waiting area for this. This is probably the hardest station to master. We have seen adults struggling to hit the bottles down for this. However we discovered a hidden pro crane master in the family. L showed the way by knocking down all the bottles , not once but THREE times in a span of 5 minutes. We reckoned that this is probably is new record at Diggersite if there is one. I had a chat with the owner and apparently more rides are planned for the future, including one that is use to move logs! If you are planning a party, you would be pleased to know that does provide construction theme parties on weekdays. It is obviously that these machines are not toys. While it is relatively save for the kids to operate the cranes as they are fitted with stoppers to limit their range to a safety level, it would be the accompanying adults or kids that caution need to be applied. For one DO NOT put your foot on the excavators as you stand alongside with your kids. One twist of the lever controlling your machines could mean trouble. Next , try not to stay too close to the machine while you are watching. The machine does turn from side to side and might hit you. It will be great if signs are in place to remind everyone of the potential dangers. Nonetheless if you practise personal safety, these will not be an issue. For those who are interested, park branded t shirts and mini cranes are on sale. A little secret from the owner , Mr Lim. He had initially set this up to sell his die cast CAT construction models. However it seemed that the rides have now taken over as the main attraction . It is also noted that this might not be permanent as the lease for the raintree cove will expire next year due to upgrading plans. So we do reckon you should head down and enjoy it while you still can. So what is the boys verdict. As for me, I feel that this is aa great way to test your children psycho-motor skills and a once in a lifetime experience for kids.